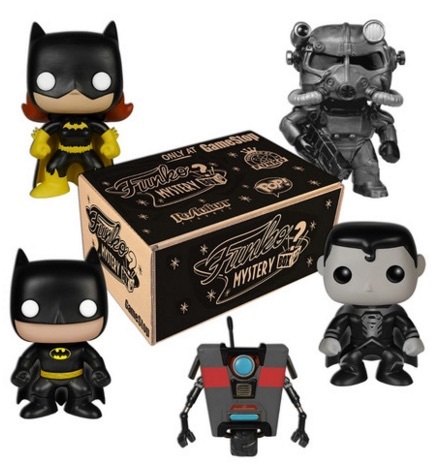 Putting a mystery spin on the Black Friday excitement, the 2015 Funko GameStop Black Friday Mystery Box offers a mix of Funko choices in one package. Each box includes one exclusive Pop! figure and is only available at GameStop locations in the United States or EB Games in Canada. For many, the big draw is the exclusive Pop! figures. This includes big names like Batman, Batgirl and Superman along with Power Armor from the Fallout games and Claptrap from the Borderlands franchise. Although the actual figures have appeared before, these versions are only found in the Funko Mystery Box. 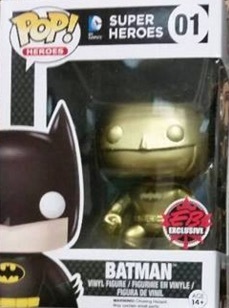 Adding more to the mix, approximately one in eight boxes will contain a super-rare chase Golden Pop! vinyl figure. However, this is not the only thing to be found in the special boxes. In addition to the exclusive Pop! figure, collectors can find an assortment that includes ReAction figures, a Pop! Pin and a Pocket Pop! keychain. These are not exclusives. The retail price for the box is $20.